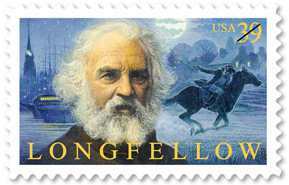 The United States Postal Service will issue a stamp on March 15, 2007 to commemorate the bicentennial of Longfellow's birth. Longfellow served as Librarian of Bowdoin College Library in Brunswick, Maine from 1829-1835 during the same period in which he taught modern languages for the College. It was typical for colleges to tap a faculty member to serve as librarian on a part-time basis. 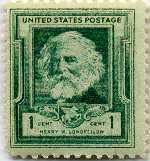 An earlier stamp was issued to honor Longfellow in 1940 as part of the Famous Americans stamp series. 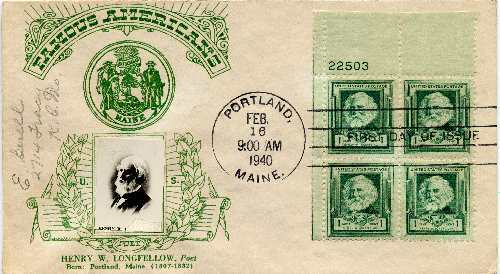 One of many first day covers issued in conjunction with the 1940 stamp. Russia issued a stamp in 1958 to honor Longfellow. 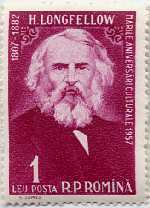 Romania also issued a stamp in 1958 to honor Longfellow.